Greetings! Spring is in the air and we are back with another changelog. Check out the Nitrado changelog and what happened last month below! March was an exciting month! Nitrado was over at PaxEast in Boston this year with a booth set up right next to Farming Simulator 19. The Nitrado Family has had a blast handing out Nitrado swag and hanging out with some awesome people. Outlaws of the Old West, Now Available at Nitrado! Outlaws of the Old West has been added to the Nitrado Game Cloud! Conquer the desert, fight your way through the swamps or climb the mountains of this vast, yet undiscovered world. Where rough men are used to rough ways, Its time to write your own story. Pick up your private server with Nitrado and explore the old west today! Rent your own Outlaws Server with Nitrado today!! The developers over at War Drum Studios recently released the "PvX Clock" game mode. You can now enjoy PvP and PvE on the same map! Check out some details on the new game mode below. More Information about the PvX Clock Game Mode! We have opened the doors again to general Nitrado Partnership applications! If you're looking to work closely with the world leading Game Server Host on a project or our on-going requirements, the time is now. Learn more with the details and link below! What can you expect for being a Nitrado Partner? Want to know more about our Partner Program? Check out our Partnership Program Page and sign up today! Click Here for More Information, and Apply Today! New gameplay settings for zombie movement in 7 days to die. ARK Valentines Day can now be activated at any time. Added the vday option to the “Active Event” option in your general settings. Atlas Clusters are now also working across locations again. Added mod support for Atlas. In order to enable mods on the server, enter your MOD ids separated by a comma in the "mods" section in your general settings. Added mod support for Miscreated. In order to enable mods on the server, enter your MOD ids separated by a comma in the "mods" section in your general settings. Added all of the new maps to Space Engineers and removed old maps which were no longer working. Space engineers settings have been overhauled in the Nitrado system. There are quite a few new settings, old, deprecated settings got removed and some of them got renamed. 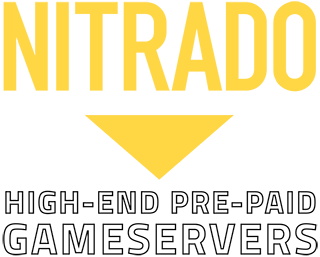 Enjoy your favorite games, best played on your own Nitrado.net Game Server! Rent your Own Server with Nitrado Today! !